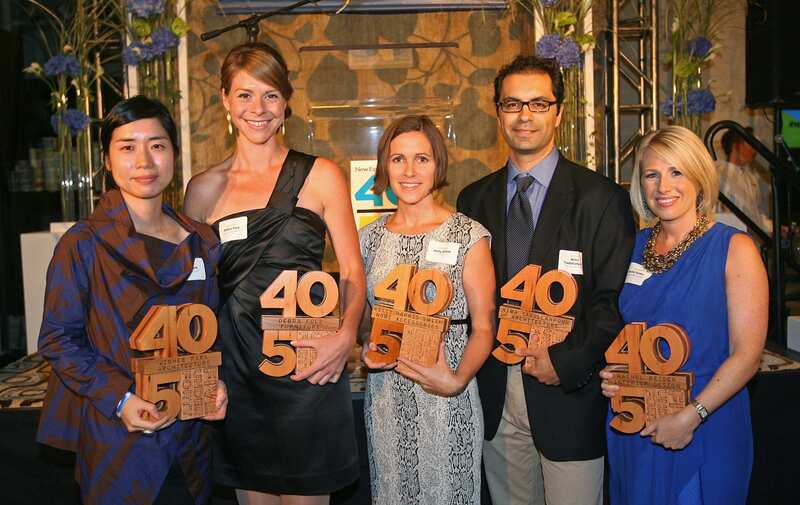 From left to right, “5 Under 40” 2019 winners: Special category, lighting: Yukinori Miles Endo, Studio Endo (Providence, RI); Landscape Design: Cheryl Russ, Glengate Company (Wilton, CT); Interior Design: Tyler Karu, Tyler Karu Design + Interiors (Portland, ME) and Dane Austin, Dane Austin Design (Boston, MA); Architecture: Thomas McNeill, Hutker Architects (Falmouth, Vineyard Haven, and Boston, MA). These winners will be honored at the Tenth Annual “5 Under 40” Awards Ceremony on September 12, 2019. From left to right, “5 Under 40” 2018 winners: Architecture: Jeremy Jih, J.Roc Design (Boston, MA), Interior Design: Sarah Scales, Sarah Scales Design Studio (Braintree, MA), Calla McNamara, Calla Studio (South Norwalk, CT), Kelly Healy, Belhaakon Interior Design (Ipswich, MA) and Landscape Design: Russell Stott, Andover Landscape – A Design Build Firm (Andover, MA). These winners will be honored at the Ninth Annual “5 Under 40” Awards Ceremony on September 13, 2018. Click here to purchase tickets! From left to right: Architecture: Maggie Mink, Marcus Gleysteen Architects (Boston, MA), Specialty; Textiles: Ellisha Alexina, Ellisha Alexina (Easthampton, MA),, Interior Design: Kristina Crestin, Kristina Crestin Design (Manchester-by-the-Sea, MA), Interior Design: Erin Gates, Erin Gates Design (Newton, MA), Interior Design: Nina Farmer, Nina Farmer Interiors (Boston, MA). From left to right: Specialty Design: Tile: Esther & Paul Halferty, Lilywork Artisan Tile (Pawcatuck, CT), Landscape Design: John Haven, LeBlanc Jones Landscape Architects (Boston, MA), Interior Design: Jayme Kennerknecht, Kennerknecht Design Group (Wenham, MA), Architecture & Specialty Design: Furniture: Benjamin Uyeda,HomeMade Modern, ZeroEnergy Design (Boston, MA), Architecture: Caleb Johnson, Caleb Johnson Architects + Builders (Biddeford, ME).